Press Secretary Sarah Sanders said Tuesday President Trump's tweet that Sen. Kirsten Gillibrand "would do anything" for campaign contributions wasn't a sexual innuendo. "Only if your mind is in the gutter would you have read it that way," she said. Sanders added that Trump was referring to political "corruption." Sanders argued that Trump had used similar terminology many times to refer to both male and female politicians of both parties. "There's no way that this is sexist at all," she said. Does Trump want a second special counsel to investigate the investigators? "I think it's something that certainly causes a lot of concern not just for the president and the administration but for all Americans... this looks really bad and this is something we should definitely look at." On Sen. Gillibrand: "I'm talking about the fact that she's controlled by special interests, I'm talking about the fact that she's a wholly owned subsidiary of people who donate to her campaign, she's a puppet for Chuck Schumer." 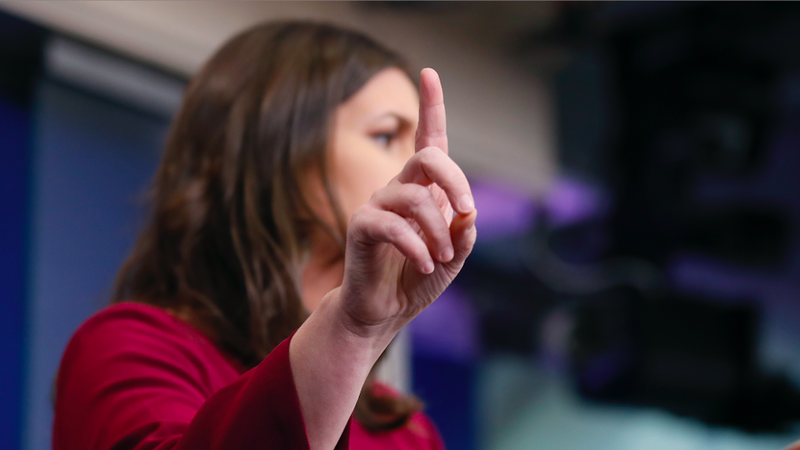 On foreign autocrats using "fake news" to deflect criticism: "I think the White House is concerned about false and inaccurate information being pushed out to mislead the American people," Sanders said, dodging the question. At the top of the briefing, Dept. of Homeland Security official Lee Cissna talked immigration reform in light of the recent attempted terror attack in New York. The suspect, a Bangladeshi national, entered the U.S. through family connections via chain migration, he said. Cissna also said the U.S.'s diversity visa program "is wracked with fraud" and "vulnerable to exploitation by terrorists."